This apron is suitable for children in elementary grades. It is made from blue denim with stitched-on ties. 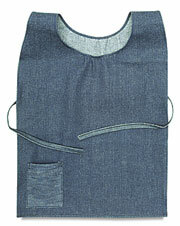 Apron measure 18" wide × 24" long (46 cm × 61 cm) in the front, with an 8" (20 cm) overlap in the back.